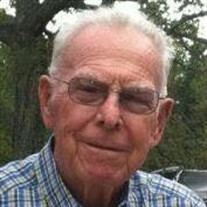 John William "Bill" Lattimore, age 88, of Rutherfordton, NC, died Tuesday, January 30, 2018, at Rutherford Regional Medical Center . He was son of the late James Thomas Lattimore and Kate Lynch Lattimore and a native of Rutherford County. Bill was a member of Rock Springs Baptist Church and a U.S. Army veteran of the Korean War. He was a loving husband, father and grandfather. He was preceded in death by two sisters: Doris Crawford and Marjorie McClure; one brother James Thomas Lattimore Jr. He is survived by his loving wife of 62 years of marriage: Betty Lattimore. Eight Grandchildren: Sarah, Rebekah, Bethany, Hilary, Christian, Hunter, Elise, Ethan. The family will receive friends from 2:00 PM to 3:00 PM, Sunday, February 4, 2018 at Rock Springs baptist Church. The funeral service will be at Rock Springs Baptist Church at 3:00 PM, Sunday, February 4, 2018 with Reverend Greg Huntley and Reverend Bobby Wilkerson officiating. Interment will be at Rock Springs Baptist Church Cemetery. In lieu of flowers memorials may be made to Rock Springs Baptist Church Building Fund c/o Kathy Lattimore; 986 Lattimore Road; Rutherfordton, N C 28139.